Rachel co-founded Birds Eye View as a touring short film event in 2002, motivated by the statistic that only 7% filmmakers are women. She has since led the organisation to become the high profile national arts charity it is today. Rachel heads up company development and creative direction of all projects, including the artistic direction of our annual international film festival. Rachel graduated in Theology from Oxford University in 1999 and then took postgraduate studies at the African Gender Institute at the University of Cape Town. Before focussing solely on Birds Eye View, she worked as a researcher for independent television & radio production companies. Rachel has written for the New Statesman, the Financial Times Magazine and the Guardian on women in film, and on the media representation of people with disabilities. Rachel was nominated a “world changing woman” by the Guardian in August 2006 and a Media Award nominee at the 2010 Women of the Future Awards. 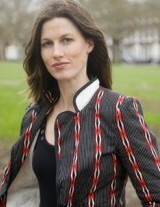 She is also named as one of the 50 “Women to Watch” by 2010 by Arts Council England and Cultural Leadership Programme. Rachel is currently the film fellow on the Clore leadership programme. Rachel is married and has one daughter, born on the opening day of the Birds Eye View Film Festival 2010.